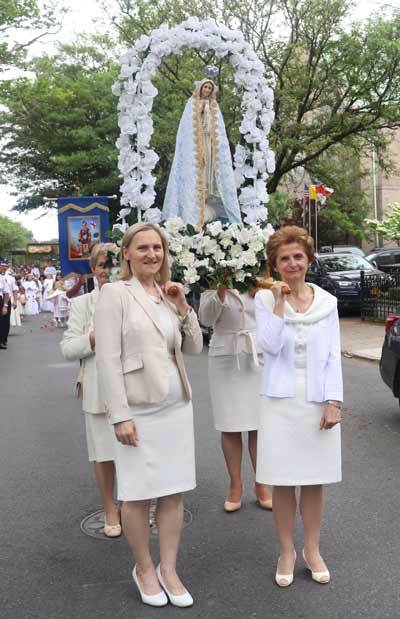 Brooklyn Polonia’s deep love and devotion to the Hidden Lord impressed the representative of the pope when he joined them in Borough Park for an elaborate Corpus Christi procession. Archbishop Berndardito Auza, the permanent observer of the Holy See to the United Nations, is Filipino and has never experienced such a celebration of Corpus Christi. The Filipino people, he explained, express their Catholic devotion with many beautiful outdoor processions for Holy Week and Santo Niño, but not for Corpus Christi. He had joined a Corpus Christi procession in Italy when he was working at the Vatican, but it was not of the same scale, he said. 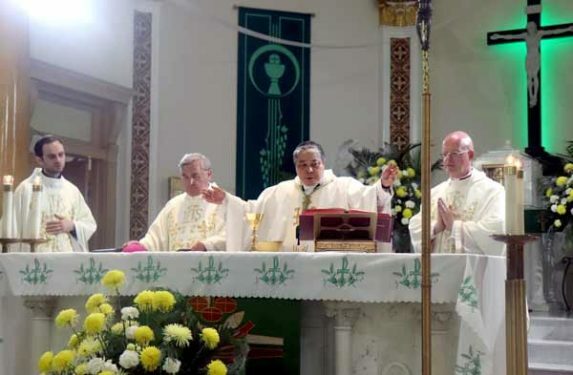 Therefore, he decided to accept the invitation to celebrate the Mass and procession with St. Frances de Chantal parish at 11 a.m., which he rushed over from Manhattan to attend after celebrating Mass for the opening of the Philippine Independence Day parade in Manhattan. Referring to Pope Francis’ apostolic exhortation “Joy of the Gospel,” he said popular piety, the traditions surrounding the faith and public displays of faith, are central in the new evangelization. Archbishop Auza praised the St. Frances de Chantal parish community for not having forgotten its ancient traditions. 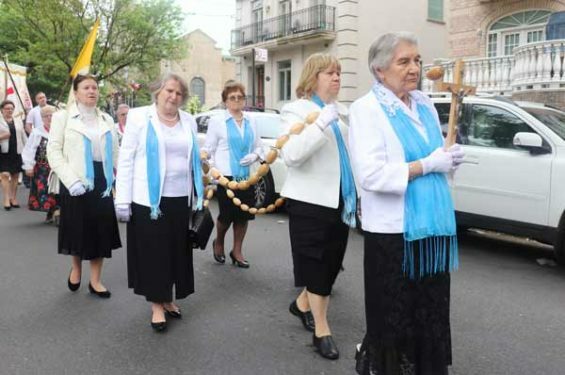 Women walk in procession for the feast of Corpus Christi with St. Frances de Chantal parish. 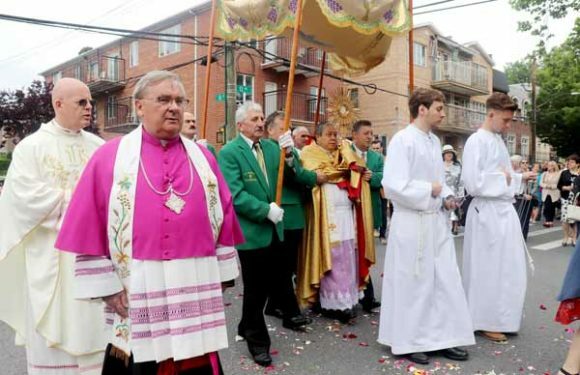 For the Polish people, Corpus Christi is a major religious and public holiday. In Poland, it is always celebrated on Thursday and it is a day off from work. People travel to their hometowns, akin to the tradition of Thanksgiving in the U.S. However, instead of gathering together as a family unit, the main goal is to gather as a parish. In small towns especially, this is an all-hands affair. 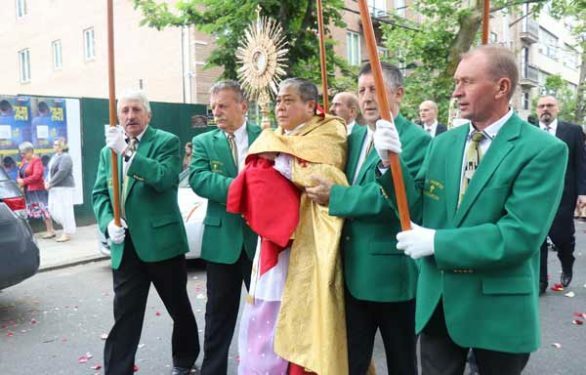 In more traditional towns, where farming is still a big way of life, the Corpus Christi processions extend to the outer limits where Jesus’ presence in the Blessed Sacrament is welcomed to the farmers’ fields. St. Frances de Chantal parish held true to the ancient customs and welcomed Jesus to their neighborhood. They celebrated a standing room-only Mass and then followed the Blessed Sacrament into the street. 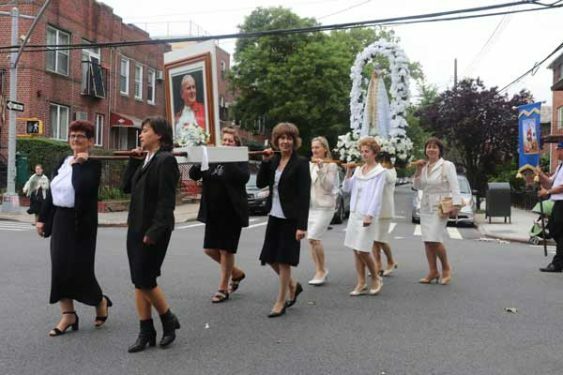 Accompanying the Body and Blood of the Savior were: relics of Pope John Paul II, St. Frances de Chantal and the True Cross; men and women dressed in traditional Polish garb; altar servers behind the crossbearer; representatives of parish prayer groups; the Knights of the Holy Sepulchre, the parish guard, and of course, the iconic flower girls and bell boys dressed in white preparing a path for the Lord. 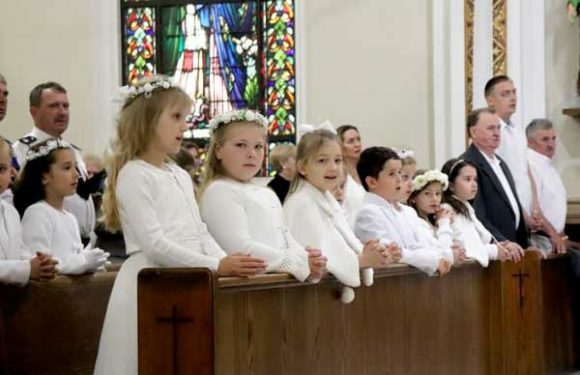 Serving as a flower girl in the procession, usually done until one grows out of her First Communion dress, is a huge deal in the life of young Polish girls and serves as a point of great pride for parents. Although the rain held out for the procession, it was chilly and windy. 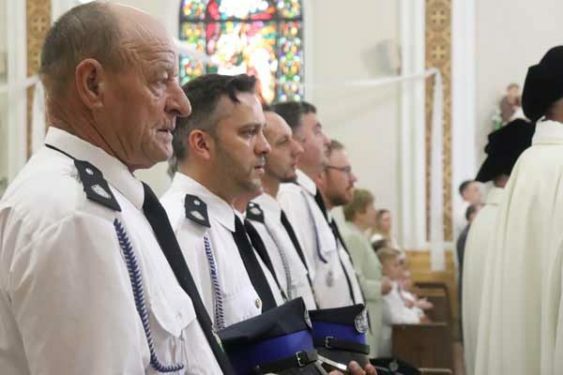 After the closing prayers were sung at the fourth altar in front of church, the pastor thanked everyone for their participation and hard work. Canon Andrzej Kurowski, S.A.C., pastor, especially thanked young children for persevering through the weather. Msgr. Tomasz Grysa, Archbishop Auza’s first counselor, preached the homily in Polish, but his message brought the audience to the American West. Msgr. 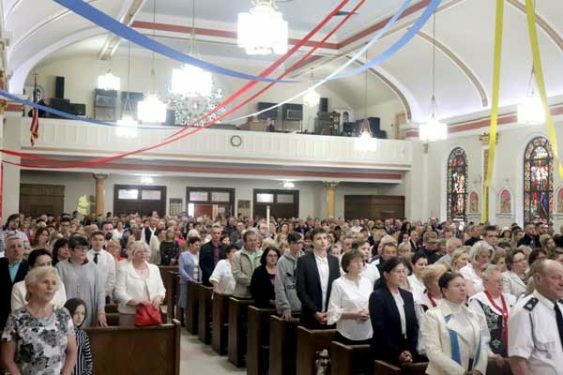 Grysa told the congregation of a town in California with great respect for their pastor and a deference to the Lord that exemplified the importance of foregoing one’s own plans in favor of the will of God. 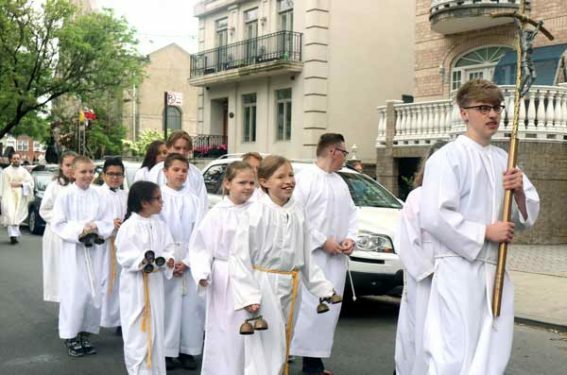 He said this parish, just like St. Frances de Chantal, gathered at Mass before heading out to their planned route for their Corpus Christi procession. They followed their pastor to the first altar, then the second, the third and the fourth. But after the fourth altar, something strange happened. The pastor kept going. The parishioners were confused, but out of respect for their parish priest, they followed behind the Blessed Sacrament. They kept going until they reached the edge of town; it is here that some in the procession tried to tell the pastor that it was time to head back to church. But the pastor did not listen. In fact, he began to hasten his pace, as if there was urgency. The entire parish followed and when they were about a mile or so out of town, an earthquake hit and destroyed the town. The people were saved because they followed and trusted Jesus even when they did not understand what was happening. When they rebuilt the town, they also gave it a new name: Sacramento. Msgr. Grysa urged the St. Frances de Chantal congregation to always trust in Him who gave His own Body and Blood as recompense for the sins of the world.